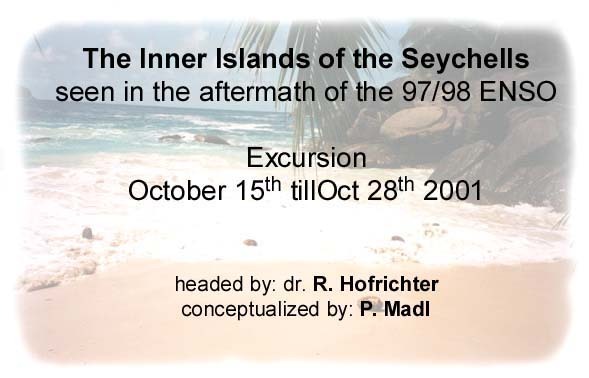 This year's two-week excursion brought us (a group of Swiss-Austro-German students) to the very large archipelagic nation of the Seychelles in the western Indian Ocean. Although this excursion aimed both at the fascinating terrestrial and marine ecosystems, the native flora and fauna. It is the attempt of this paper to focus and reflect on the marine ecosystem. The marine environment is of particular interest, as a particular strong ENSO-event (El Niño-Southern Oscillation during the 1997/98 season) caused severe damage to the hermatypic coral reef fauna. In accordance to the islands visited, the observations made in this paper only regard the inner islands (Mahé and the surrounding islands of Conception and, Thérèse; Pralin and the surrounding islands of Cousin, Curieuse, and St. Pierre; as well as La Digue) with brief comparative descriptions based on several sources regarding the outer islands. With the limited time budget available, we tried when- and wherever possible, to document the current situation in order to provide evidence in the extent of recovery (close-up's come along with a colored scale bar - units in cm). 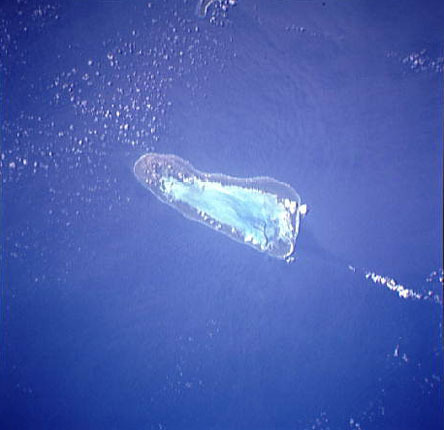 low coralline islands, commonly named "outer islands", that spread over a radius of roughly 1000km to the south and south-west. 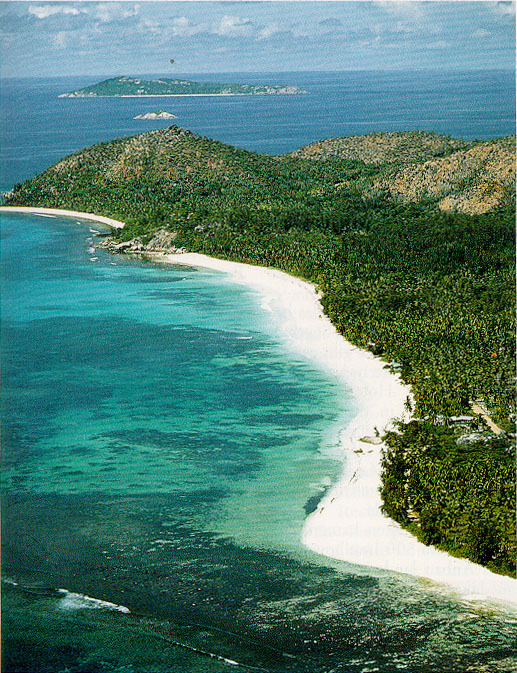 The Seychelles Bank lies at the northernmost point of the Mascarene Ridge (north-east of Madagascar) and is a large, shallow area of water (some 31000 km2), mostly not deeper than 100m. In its center are a number of high granitic islands of continental origin. These have been referred to as a "micro-continent", having been left behind during the northwards migration of the Indian sub-continent about 135×E6 years ago. These islands are surrounded by widespread but discontinuous fringing reefs. Reef Sites of the Seychelles: Coral cover varies, being virtually absent from some reef structures, but abundant in other areas, including non-reefal slopes and granitic surfaces. The low coralline outer islands to the south-west of the main island of Mahé are grouped into a number of geographic sections. The largest is that of the Amirante Islands, which extend along a shallow north-south ridge, with the Alphonse group forming a slightly separate southern section of this chain. 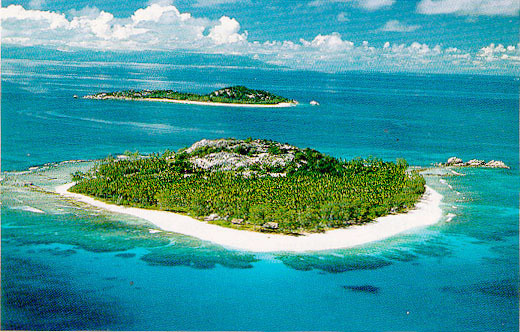 Further south are two small and more disparate island groups, those of Providence, Farquhar, Cosmoledo, and the Aldabra group. 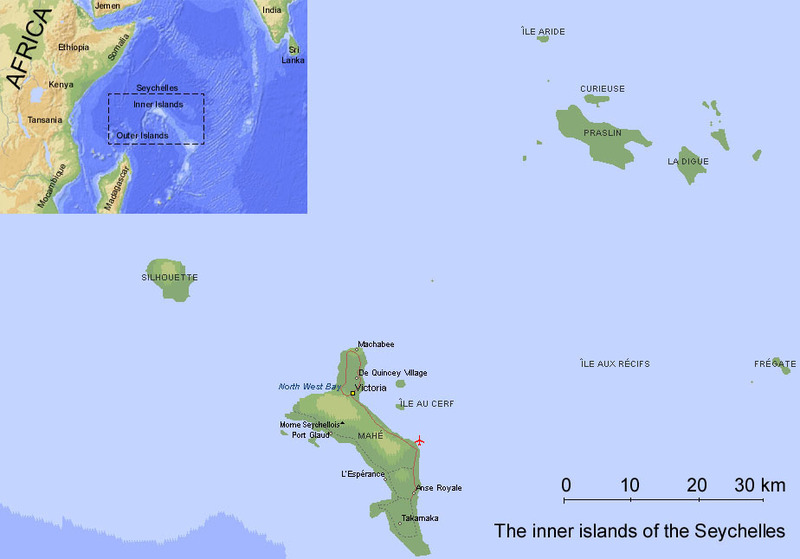 Finally, directly to the south / south-east of the main island of Mahé are the isolated islands of Platte and Coetivy. The reefs in these outer island areas are highly varied, and include true atolls (St. Joseph, Alphonse, Farquhar), raised atolls (Aldabra), submerged or partially submerged atolls (Desroches, Coetivy), and platform or bank structures (African Banks, Providence-Cerf). Prior to the 97/98 ENSO event, coral cover varied considerably between localities, ranging from close to zero on some banks and reef slopes (notably the larger Providence-Cerf Bank), to 60-70% on some atoll slopes. Along the main islands, east coast of Mahé and the west coast of Pralin fringing reefs were well developed; e.g. reef slopes descending to a floor typically at 8-12m follow reef flats reaching over 2km in width and terminating in a high algal ridge. Such clearly zoned reefs are less apparent in more sheltered locations where more complex reef formations have developed. The Seychelles lie in an area of relatively high faunal diversity. Some 100 hermatypic and 7 endemic coral species (Veron, 2000) and 920 fish species (Spalding; 2001) have been listed. The reef fauna is typical of the western Indian Ocean, as exemplified by the reef fish: many are widespread across the ocean basin or wider areas of the Indo-Pacific, however, about 15% are confined to the western part (Spalding, et al, 2001).